Founder of Ubuntu Finland, Debian Developer, translator in Gnome, Ubuntu, Pidgin etc. When setting up my second FreeRunner to use Debian, I took care to document how I had ended up with the Debian system I've been using. At the same time, I made some of my ugly hacks a bit less ugly. I have been also working on packaging the software I use in Debian, if they are not available there (like literki, woosh). This series of commands and configuration is aimed for people who wish to have similar setup, or simply learn potentially very useful things if the default Debian setup is too dull. The images show a running setup. The instructions are divided in three sections, the two first (Nice and Ugly) you are probably quite interested in. The Bad thing is needed as well by the other configuration but you may choose to compile the software yourself. The instructions below were a one-time effort in March 2010. After that I've done a great deal of changes, so they are not up to date what I'm using. Nevertheless, they will certainly contain interesting information to start making Your Debian instead. The instructions used openmoko-panel-plugin as an example, but in reality I prefer finger usable applications so I used a heavily modified, but alas non-free / freedom uncertain mokoservices.py. 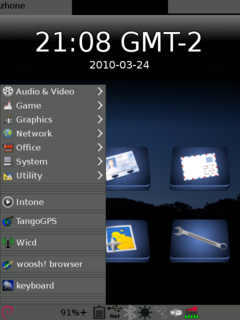 [06/2010] I have now written a hackish C application of my own to handle both screen lock, application switching and hardware control as used to be provided by mokoservices.py and openmoko-panel-plugin. It is not very ready for general consumption, but I love it myself :P Sources are GPLv3, I may publish them for reference later or simply a send a copy on request. I've switched from Darklooks theme to original "Moko" theme that was developed for Om2007.2. I'm currently not exactly sure where I've copied it from, but probably unpacked some .opk package in Openmoko repositories. 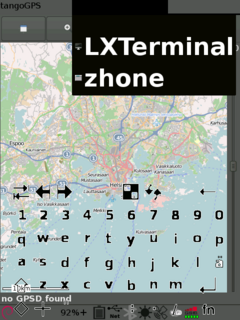 The benefit is tremendously faster GTK button display. These instructions were written in March 2010. I like my current setup more, read about changes done after these above. Now you can connect to Neo from your desktop as root. # Now attach the USB cable and check that connection between your desktop and Neo works. # original license (if modified from upstream) or BSD. /root/.fbpanel/default: my fbpanel configuration, cat for details. Note that Debian logo menu's active area is four times the width of the actual (visible) icon. /root/.xsession: this is the big one importance-wise, crude hacks to have fbpanel and literki nicely behaving among else. quite well commented. This is the really bad stuff, binaries from random source (me)! Luckily you can compile these three pieces of software easily yourself as well, although that means you need to install development environment on the Neo as well.